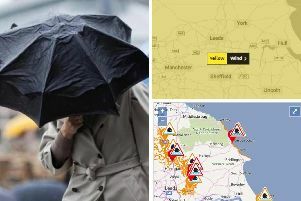 The Met Office has issued weather warnings for heavy rain and strong winds in West Yorkshire. The yellow ‘be aware’ warning for raini is valid from 5pm today (Monday) until 2am tomorrow. The spokesperson said the public should be aware of the risk of localised surface water and river flooding. The yellow warning for strong winds is valid until 7pm on Tuesday (tomorrow) and says the public should be aware of the risk of localised damage from these winds and for minor disruption to travel.